Just after finishing your studies you begin your journey of job hunting. Interview after interview and you patiently wait for a Job Offer. After a while all your hard work has paid off, you got two or more job offers from the renowned companies. Congratulations, but this is the time to choose the right one among them, and it is not easy at all. 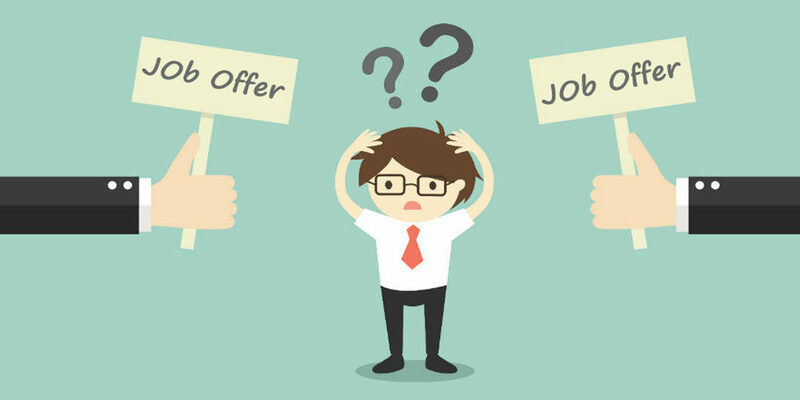 In this article, I am listing some points which you should consider before choosing your dream job. 1 – Do Research in Deep About Both Jobs. It is obvious that you get confused between two job offers. But don’t take a verdict in confusion. Take some time and find out about both jobs pros and cons. Take your time, to learn as much as you can online. Then, tap into your real-world network to see who you know who can help give you review about that company. When choosing a job between two jobs, learn about your new managers. Ask questions to make sure how is your future manager, it’s important especially in early years is. Do some extra research about both companies. You will know which one is best for you. It is very vital that you take the right decision for your career. 2 – You should Follow your Instinct. After doing all the possible research, sit ease-fully listen to your inner voice and ask yourself. When we first detect a familiar situation, we often need more information to figure out what it all means. Imagine yourself working in both companies one by one and try to figure it out which one is better for you. You know yourself better than anyone else. Your insight will surely help you to take better decision. 3 – Think About Long-term Growth. When you are confused between two jobs, spare some time. Give a thought that which job can help you to grow more. It is difficult to take a long-term view because our minds are not accustomed to think far ahead. We are conditioned to deal with what is taking place now and typically have a limited view of tomorrow. Don’t just get overwhelmed if one job is offering you more wage than your expectation. You should choose the job which can help you to achieve your long-term career goal. 4 – Consider the Office Environment. You went to both companies, so you are little familiar with their work environment. Smart businesses know that a good work environment starts with hiring the right people. So, now imagine yourself working in both the companies. Figure out what you are looking for whether it’s culture of collaboration, Independence, flexibility or new challenges. Contemplate about the companies employees and take decision wisely. After all, you are going to spend your most of the time with your colleagues.